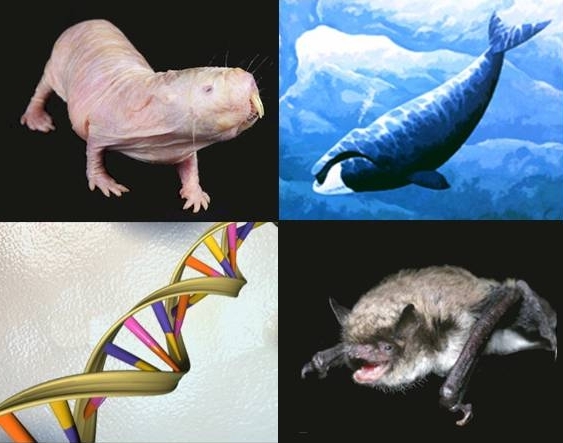 Caption: DNA studies are unraveling the secrets of these mammals (clockwise from top left): naked mole rat, bowhead whale, and Brandt’s bat. It started simply, with the analysis of a trace element in proteins. It led, through recognizing and following provocative patterns, to one of humanity’s greatest questions: what is the secret to a long life? 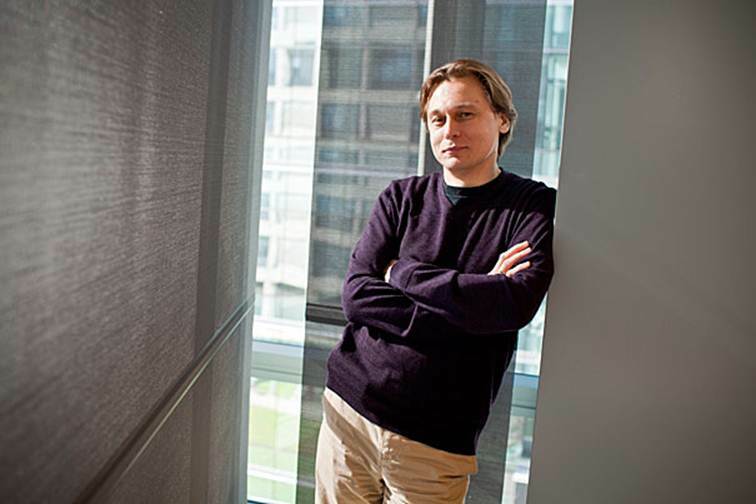 This intriguing scientific path, traveled by NIH Pioneer Awardee Vadim Gladyshev, has brought together an assortment of mammals, great and small. It has relied upon a veritable global treasure-hunt, with samples from Russian caves, East African tunnels, and Arctic oceans. It was Gladyshev’s scientific acumen that mapped this path. And it is comparative genomic analysis that provided the vehicle he has used to travel along it – right up to the threshold of new insights into healthier, longer life. Gladyshev is a professor of medicine at Brigham and Women’s Hospital at Harvard Medical School in Boston. His scientific journey began 16 years ago, with research on the proteins in the body that contain the element selenium. In 2003, he discovered that there are 25 genes in the human genome encoding proteins that contain this essential trace element, incorporated as the alternative amino acid selenocysteine . Examining these selenium-containing proteins more closely, Gladyshev observed that several of them repaired proteins; others had antioxidant or other protective properties. There seemed to be a pattern here. Perhaps these proteins protected the cell and its DNA from damage and slowed the aging process. If so, it was possible that particularly long-lived mammals had more, or more effective, selenium-containing proteins. To test this hypothesis, Gladyshev took an unusual approach. It’s well known that lifespan in mammals is correlated with size: larger animals usually live longer. However, instead of starting with large mammals, he went small. Specifically, he turned to the naked mole rat (Heterocephalus glaber – we’ll call him NMR): a wrinkly, hairless rodent from East Africa that lives up to 32 years. This lifespan is about 10-fold longer than that of the similarly-sized mouse. Along with longevity, the NMR boasts an array of advantages that has made it, despite its unimpressive appearance, a darling of medical researchers. The species is immune to cancers—both natural and experimentally induced. It can survive very low oxygen conditions that cripple human brains. It doesn’t feel certain types of pain, and it reproduces until it dies. In 2011, Gladyshev assembled a team and sequenced the NMR’s genome, in search of the genetic foundations of its extraordinary qualities. Genome sequence in hand, the team searched for the signatures of long life by comparing genes and their activity at different stages in the NMR’s lifecycle. They found that, unlike in humans, the activity of most genes changed little over time. Two of these genes, CYP46A1 and SMAD3—which drop in aging human brains—remained high in the brain of the NMR. CYP46A1 is linked to cholesterol processing and also plays a role in the tendency of the protein Aβ (which is implicated in Alzheimer’s disease) to form clumps. SMAD3 slows down cell proliferation, which may be linked to cancer resistance in the animal. Gladyshev soon looked to other long-lived mammals, to identify different genetic strategies for long life. He selected the Brandt’s bat (Myotis brandtii), from Russia. The longest-lived bat species, it has a lifespan exceeding 40 years. Gladyshev and his team sequenced the bat’s genome then looked for genes and gene activity that might confer longevity . They discovered mutations in the growth hormone receptor gene that are also carried by other long-lived bats. They also found a mutation in the insulin-like growth factor 1 receptor gene. Both genes had been linked to longevity. As for those selenium-containing proteins that launched his longevity studies, Gladyshev found that the naked mole rats, like humans, have 25 of them; but the proteins are only produced in low quantities. That seemed paradoxical—but perhaps because NMR’s cells and DNA suffer less molecular damage, they require less selenoprotein activity. Now, with his Pioneer award, Gladyshev plans to use this strategy to examine and compare the genomes and gene activities of some 50 mammals with unexpectedly long or short lifespans. He has already secured a sample from what is thought to be one of the world’s longest-lived mammals, the Arctic-dwelling bowhead whale (Balaena mysticetus)—which some reports suggest may live between 150 and 200 years. He obtained the sample in collaboration with researchers linked with a Native American population able to hunt whales. Gladyshev hopes that by discovering the constellation of active genes that correlate with long life across mammals, we might be able to activate the human gene counterparts and extend our lifespan—and delay the onset of diseases that so often consume our later years. Characterization of mammalian selenoproteomes. Kryukov GV, Castellano S, Novoselov SV, Lobanov AV, Zehtab O, Guigó R, Gladyshev VN. Science. 2003 May 30;300(5624):1439-43. Genome sequencing reveals insights into physiology and longevity of the naked mole rat. Kim EB, Fang X, Fushan AA, Huang Z, Lobanov AV, Han L, Marino SM, Sun X, Turanov AA, Yang P, Yim SH, Zhao X, Kasaikina MV, Stoletzki N, Peng C, Polak P, Xiong Z, Kiezun A, Zhu Y, Chen Y, Kryukov GV, Zhang Q, Peshkin L, Yang L, Bronson RT, Buffenstein R, Wang B, Han C, Li Q, Chen L, Zhao W, Sunyaev SR, Park TJ, Zhang G, Wang J, Gladyshev VN. Nature. 2011 Oct 12;479(7372):223-7. Genome analysis reveals insights into physiology and longevity of the Brandt’s bat Myotis brandtii. Seim I, Fang X, Xiong Z, Lobanov AV, Huang Z, Ma S, Feng Y, Turanov AA, Zhu Y, Lenz TL, Gerashchenko MV, Fan D, Hee Yim S, Yao X, Jordan D, Xiong Y, Ma Y, Lyapunov AN, Chen G, Kulakova OI, Sun Y, Lee SG, Bronson RT, Moskalev AA, Sunyaev SR, Zhang G, Krogh A, Wang J, Gladyshev VN. Nat Commun. 2013;4:2212. Selenium, eh? And if you walk into a Tokyo teppanyaki with a pretty girl, the chef will leer at you as he asks how much garlic you’d like with that.